Chat always impresses me with her attention to detail, her great use of color and her knack for pulling images and sentiments together, and this card is no exception! 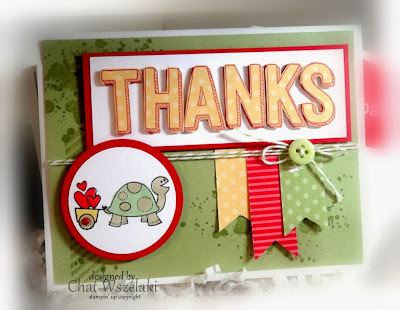 I love her paper-pieced sentiment, that adorable little turtle looking up at it and the sweet primary colors....and that background, oh, how fun! Congrats, Chat, on being my Headliner this week! Winners, please pick up your badges--available HERE! Be sure to check back tomorrow for a new challenge hosted by Claire. See you soon! Very cute card Chat. Congrats to you and the cut above honoree's. Thank you to Laurie for choosing my card. Such a cute array of cards...so much variety! Wow...Chat really hit a home run. Sooo cute. Wow these are amazing! I am tickled pink to get a shout out! Love Chat's card...congrats! Thanks, Karren, for the Cut Above honors!! !